Dr. McNamara has been the recipient of many awards, citations and acknowledgments for his participation in various professional and civic interests, including selection by his peers for inclusion on the "Best Doctors" list, in Washingtonian magazine. Dr. McNamara graduated from Notre Dame University with a B.S. in Pre-Medicine Studies in 1978. He then earned his M.D. in 1982 from West Virginia University Medical School. 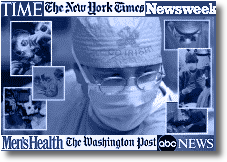 In 1983, he completed his Surgical Internship at the Washington Hospital Center, and in 1988, he completed his Otolaryngology-Head and Neck Surgery Residency at Georgetown University. After one year in private practice. Dr. McNamara continued his education and completed a one-year Fellowship in Facial Plastic Surgery in 1990. The American Board of Medical Specialties (ABMS) approved him Board Certified by the American Board of Otolaryngology in 1989. He then became a Graduate Fellow of the American Academy of Facial Plastic and Reconstructive Surgery (AAFPRS). Dr. McNamara has been appointed Assistant Clinical Professor for the Department of Otolaryngology at Georgetown University. Currently he is teaching residents in Facial Plastic and Reconstruction Surgery. His medical memberships include the American Academy of Otolaryngology-Head and Neck Surgery, American Medical Association, American College of Surgeons, American Academy of Facial Plastic and Reconstructive Surgery, D.C. Medical Society, and Arlington Medical Society. He is licensed to practice medicine in Washington, D.C., Virginia, and Maryland. Currently he is a member of the medical staffs of George Washington University, Georgetown, Washington Hospital Center and Sibley Memorial Hospital Johns Hopkins Medicine. Dr. McNamara is always seeking to keep abreast of new developments in his field and has been awarded the American Medical Association's Physician Recognition Award in Continuing Medical Education. University of Notre Dame - B.S. West Virginia University School of Medicine - M.D. McNamara, S.A. MD, Deeb, Z.E. MD and deFries, H.O.MD; Mandibular Preservation in Cancer of the Oral Cavity, Scientific Session 2nd International Oncology Research Conference. September 10-12, 1987. McNamara, S.A. MD; Surgical and Anesthetic Management of Carotid Body Tumors with Intraoperative EEG Monitoring, 1988 AAO-HNS Annual Meeting.